One style of tea I have yet to address on this blog is Display Tea. Although not all Display Teas are Flowering/Blooming Teas, these make up vast majority of ones that can be acquired in the West. Display Teas are more or less simply that, teas brewed primarily for their visual appear. For years I have avoided buying Display Tea since it has always felt like a waste of money (i’m far more interested in the subtleties in flavor and aroma). However, many people do gravitate to Display Tea, and actually they d0 have something of a shrouded history (no pun intended) as they all tend to come from Yunnan (which you probably know by now is the birthplace of tea). It’s actually a carefully concealed mystery (or if we apply Occam’s Razor, knowledge that has simply slipped through the sands of time) whether Display Teas are a modern invention, or if they came about as part of a pre-modern Imperial Tribute. In any case, I decided awhile back i needed to do a Display Tea Week to investigate things further. Before brewing, Display Teas are usually just a dense ball or clump of loose leaf. During steeping however, Display Teas slowly unfurl into hand-tied tea art, mimicking the blooming of a flower. Not every Display Tea will be successful, and oftentimes one will have to poke and nudge the bulb into showing its design. Display Teas tend to be made from globe amaranth, chrysanthemum, jasmine, lily, hibiscus, and osmanthus, but quite often the jasmine content drowns out all other flavors and scents (i’ve often wondered why they then would use jasmine, but it’s a Chinese thing so i doubt i’ll learn the answer any time soon). Although it’s aroma isn’t exactly bursting, this Anhuian Black does have a slight Tippy nose. Actually, in flavor though, it’s all malt and molasses. As malty and milk chocolatey as most any Yunnan Gold worth its stripes, Black Peony has a well-rounded Mao Feng pluck. 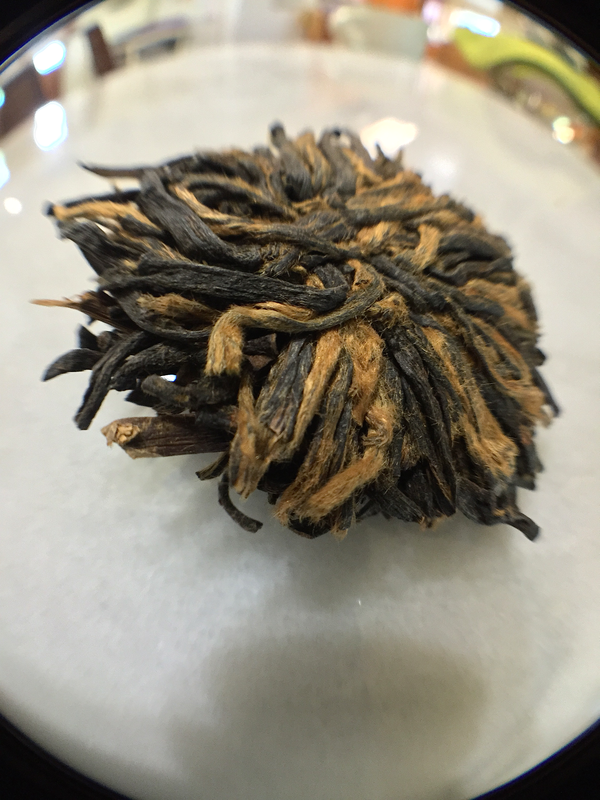 Tea grit does not disappoint: Black Peony has a hot cocoa-like melty-grit. I can imagine Black Peony brewing to a bit more Tip than i was able to get through my lab setup. Black Peony also has a really inviting bright amber liquor. Even without it though, it’s obvious Black Peony is a far older and more successful (ie. drinkable) Display Tea than most. Black Peony’s major downfall arrives in its inability for its leaves to really unfurl. Black Peony (Art of Tea): loose leaf by Jocilyn Mors is licensed under a Creative Commons Attribution-ShareAlike 4.0 International License. Black Peony (Art of Tea): loose leaf Macro by Jocilyn Mors is licensed under a Creative Commons Attribution-ShareAlike 4.0 International License. Black Peony (Art of Tea): spent by Jocilyn Mors is licensed under a Creative Commons Attribution-ShareAlike 4.0 International License. Black Peony (Art of Tea): On DisplayA by Jocilyn Mors is licensed under a Creative Commons Attribution-ShareAlike 4.0 International License. Black Peony (Art of Tea): On DisplayB by Jocilyn Mors is licensed under a Creative Commons Attribution-ShareAlike 4.0 International License. Black Peony (Art of Tea): liquor by Jocilyn Mors is licensed under a Creative Commons Attribution-ShareAlike 4.0 International License.